A simple-spec tractor that McCormick distributor AgriArgo UK has identified as a cost-effective machine for the daily cleaning-up routine on dairy farms will be seen for the first time in the UK at the Grassland & Muck event on Stand 426 in the static exhibits area. 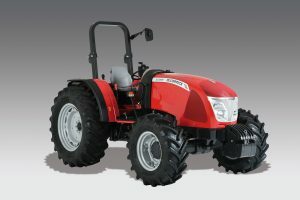 The 74hp McCormick X4.35M is likely to be available on-farm for less than £17,950 in two-wheel drive form and £19,950 with four-wheel drive. This particular model has been selected for the ‘yard scraper’ role from the new McCormick X4M Series introduced by McCormick manufacturer Argo Tractors, so it benefits from the latest transmission, axle and hydraulics. This 74hp X4.35M has been selected from a new simple McCormick series as a great scraper tractor option for dairy farmers. 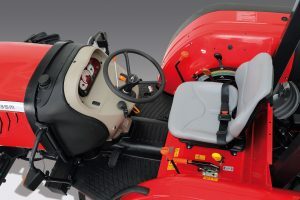 The 74hp X4.35M’s specification is kept as simple as possible – so the 12×12 (or 16×16 creep) transmission is operated by right- and left-hand levers on a largely bare hose-down platform. Standard equipment includes radial rear tyres (slightly narrower 14.9R28s than the 420/70R30 tyres pictured) for good grip and wear resistance.